Some useful extras for your event or party which we can also provide. A traditional bar, 3m long, purpose built to use within a 3m x 3m Pop Up, but also as effective standing alone within a larger tent. Additions to all our bars include, under counter fridge, fridge freezer, optic racks, stools, benches, poseur tables and rattan furniture. Add a bar service via the Pop Up Directory to help make your party run smoothly. The light effect can be programmed to various colours, static, flashing, or fading. The front is 3 metres straight, the two 2 metre sides can be used to make various layouts to fit your space. Fits well within both the Pop Up and Capri range. It has been used as a feature bar inside Nanpantan Hall. A striking feature for any event, it can be semi-circular, circular or oval. It is approx 3 metres across. 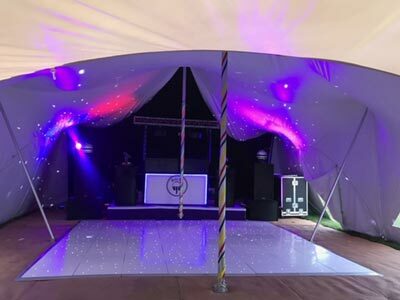 3m x 3m wooden stage, purpose built to use within a 3m x 3m Pop Up, but stage can also be increased in size to be effective standing alone within a larger tent. Quality flooring, dark grey or hessian in colour. Carpeting available in various colours. 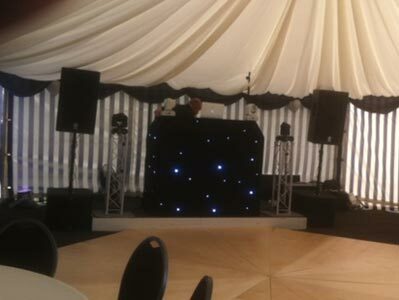 We can supply LED up-lighters and/or spot lights to add a little class to you venue. We also have fairy lights which add a lovely atmosphere to the roof space of your pop-up. Heating apparatus can be supplied on request. Toilets can be supplied on request.